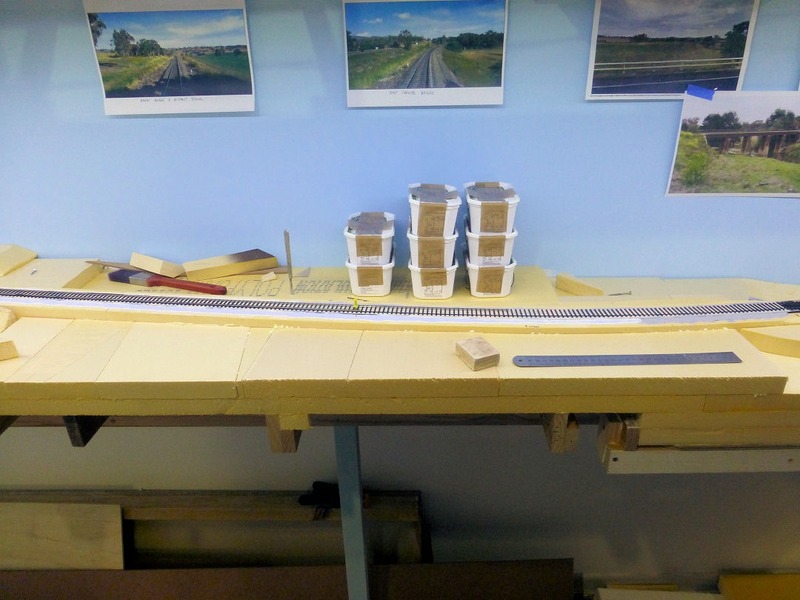 Following on from the previous post on this topic, I have started on the task of rebuilding the Sydney end of the Up staging yards. 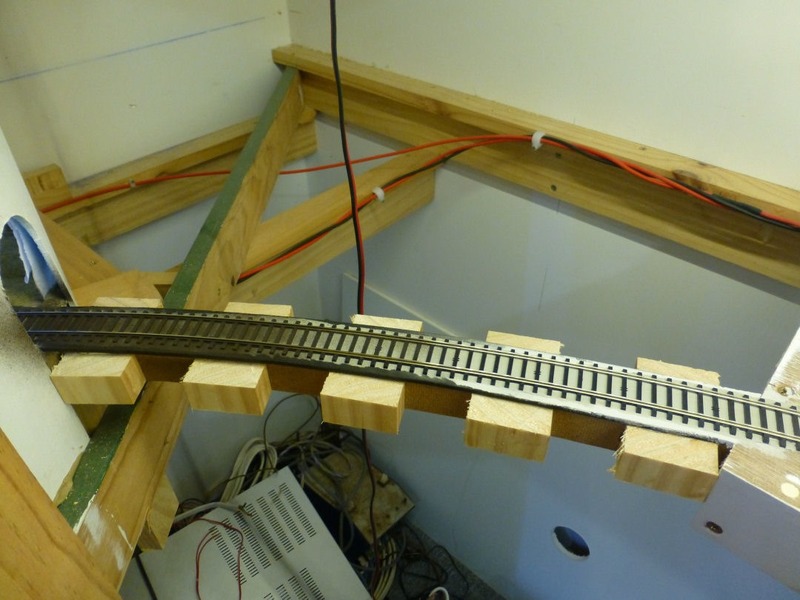 The picture above shows five existing turnouts have been removed and the first of two new 3-way turnouts installed. 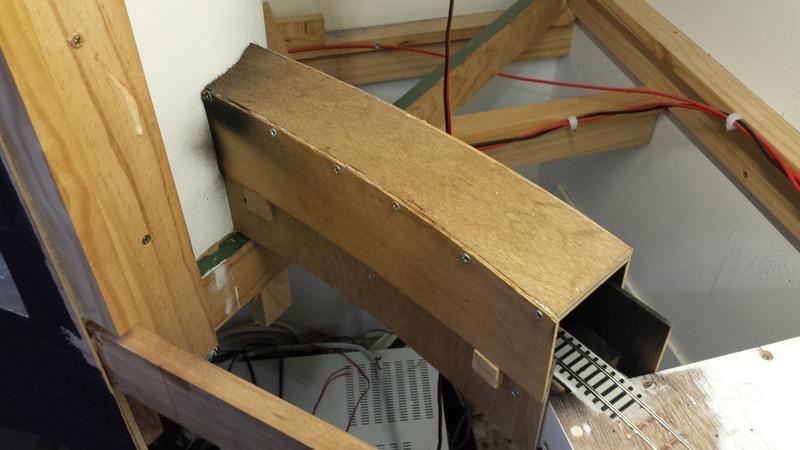 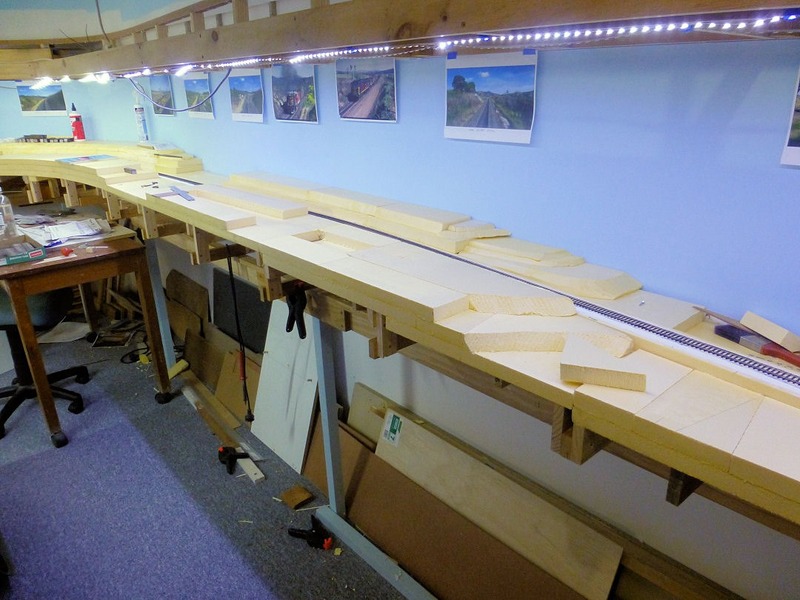 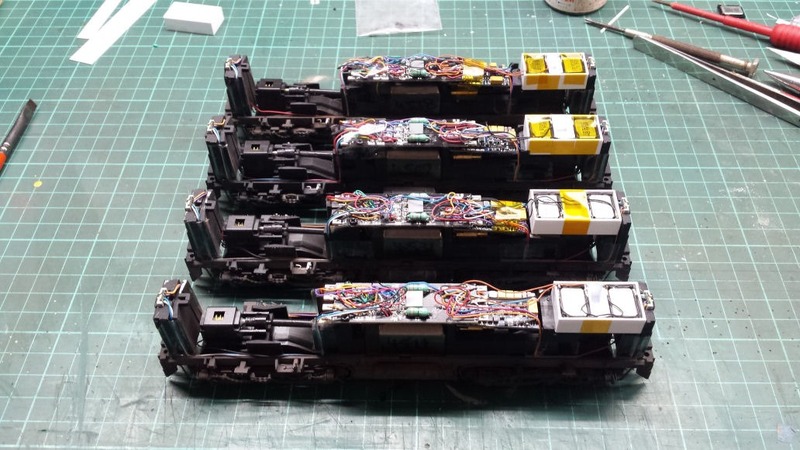 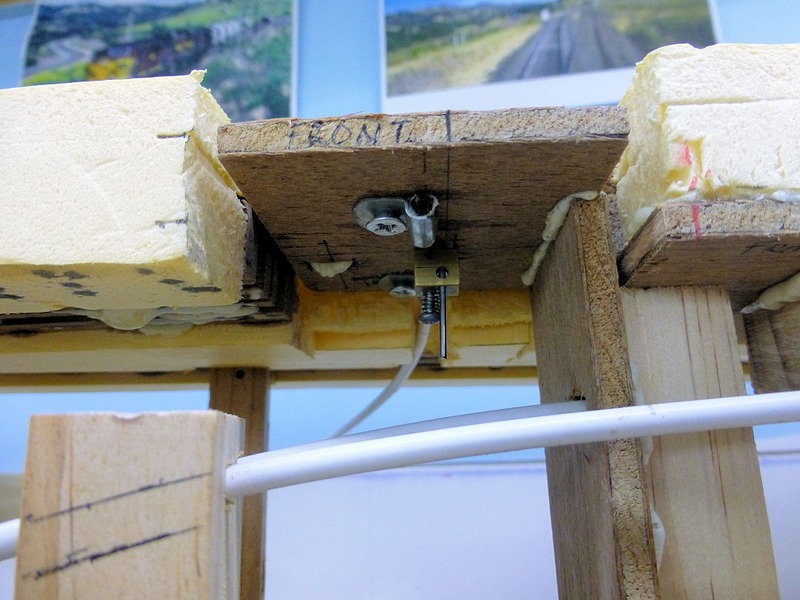 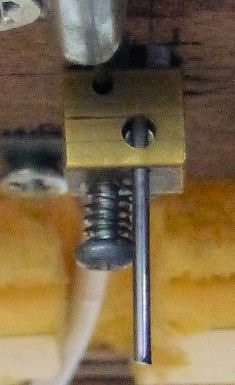 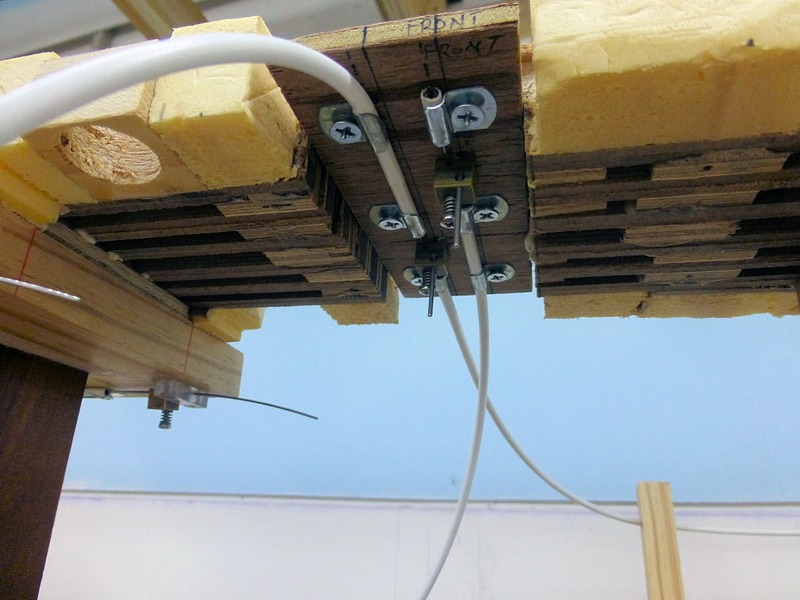 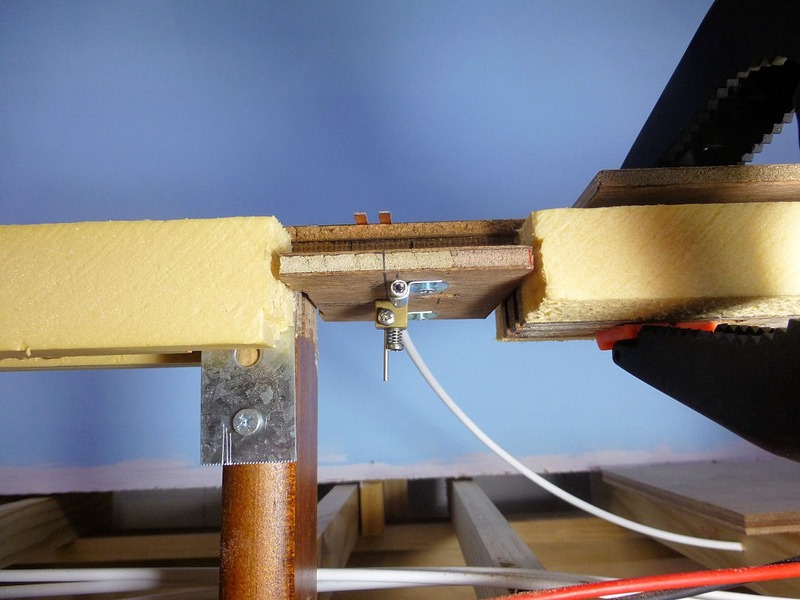 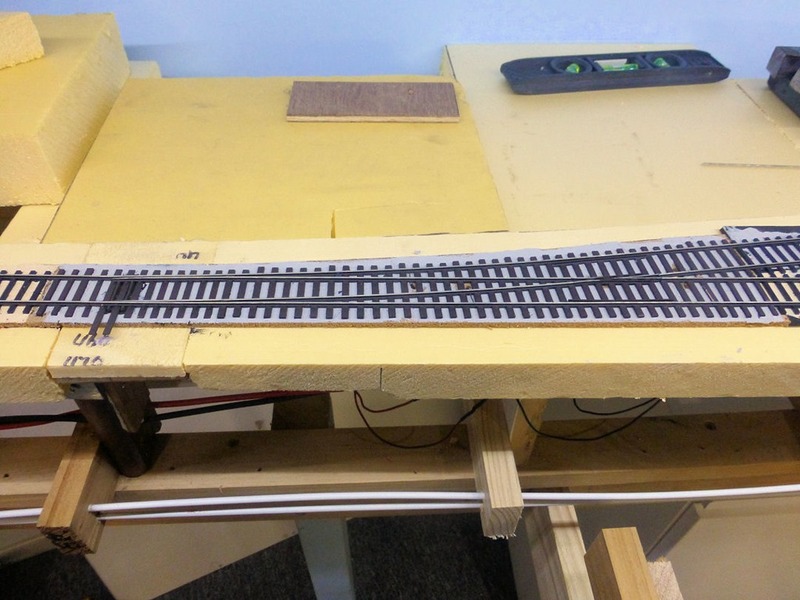 The 3-way turnouts were built on the workbench. 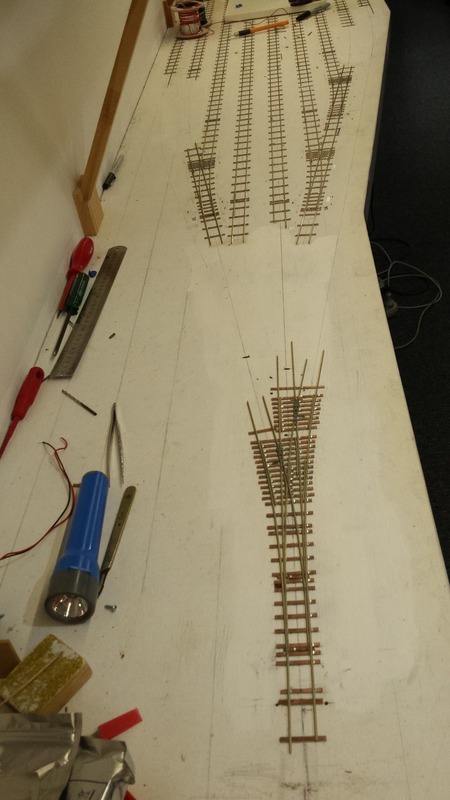 They followed the same principles as a normal turnout, but were a little tricky due to the three vee crossings. 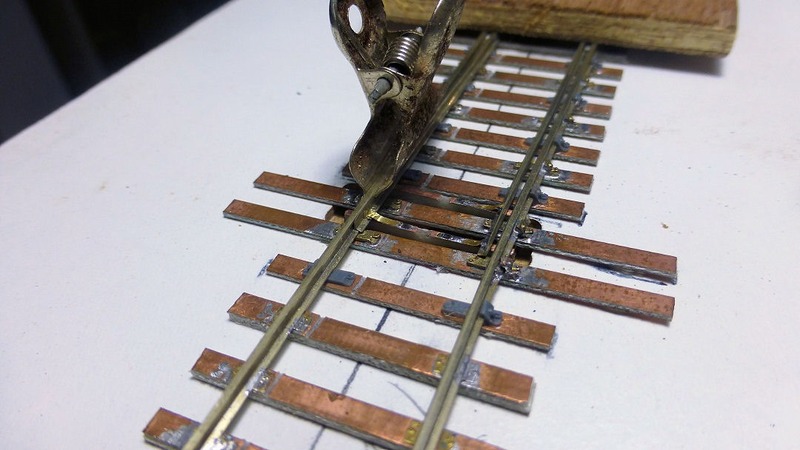 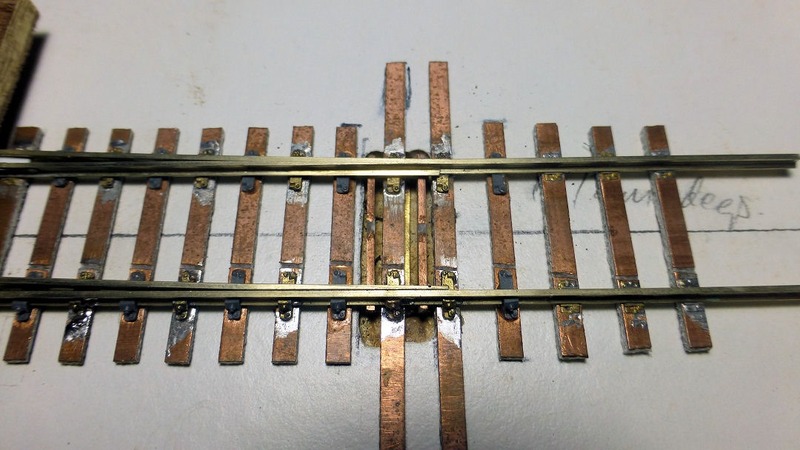 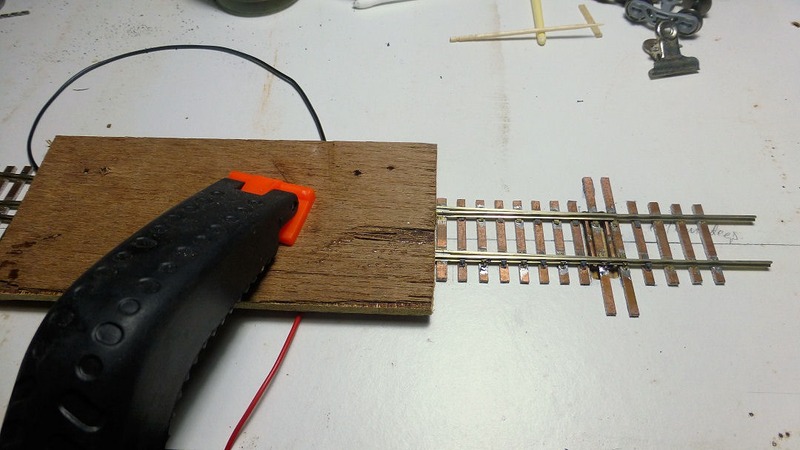 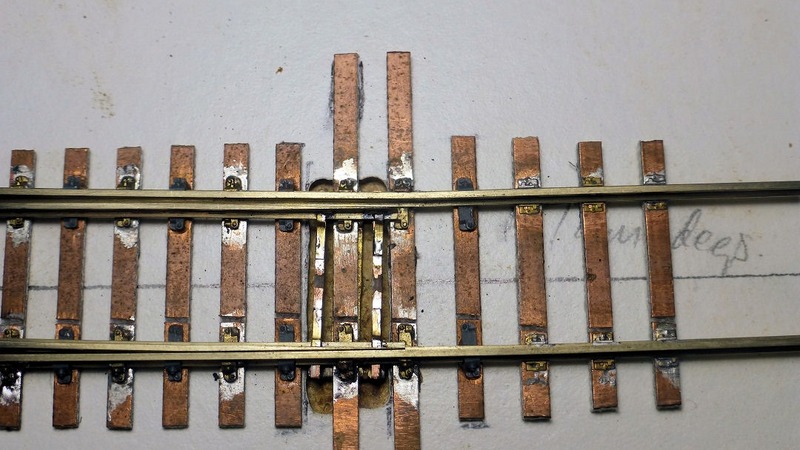 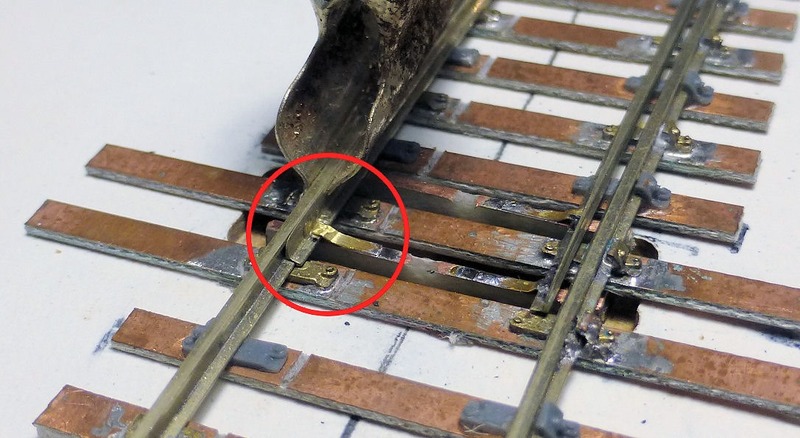 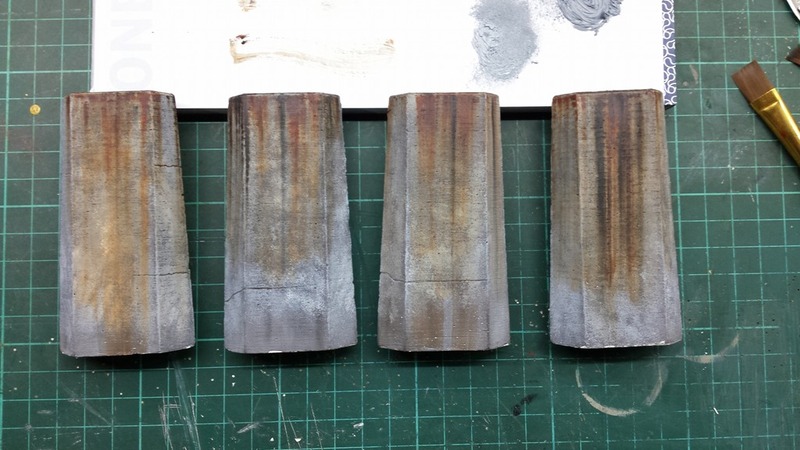 The two 1:6 vee crossings were made from the same etched components as I have used for the turnouts at Kankool, but the third one had to be scratchbuilt, as the crossing angle was around 1 in 4. 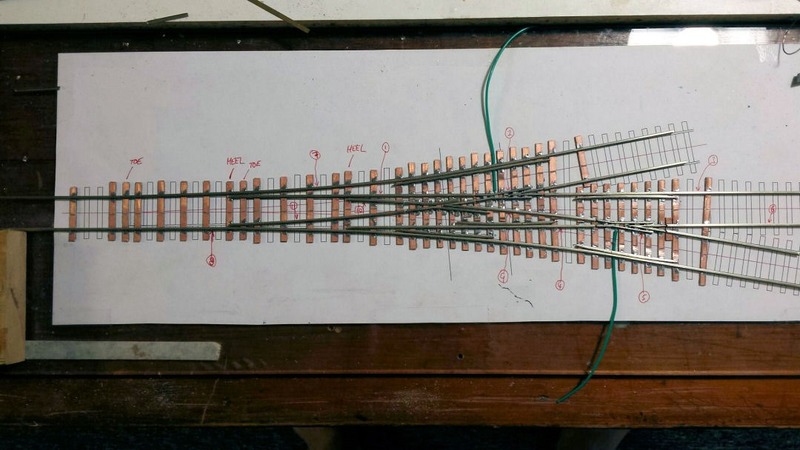 I drew up a new drawing which was an amalgamation of two 1:6 turnouts (left hand and right hand). 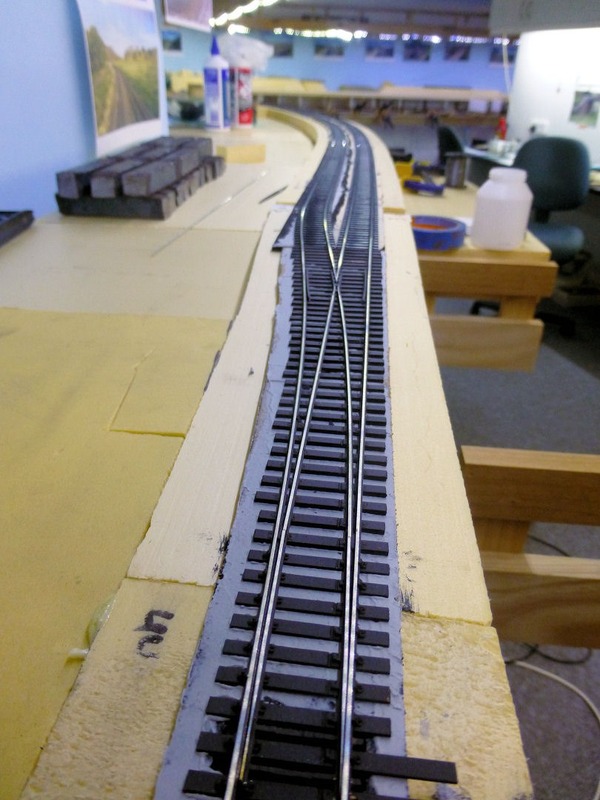 Once tidied up, I had a template for the 3-way turnout. 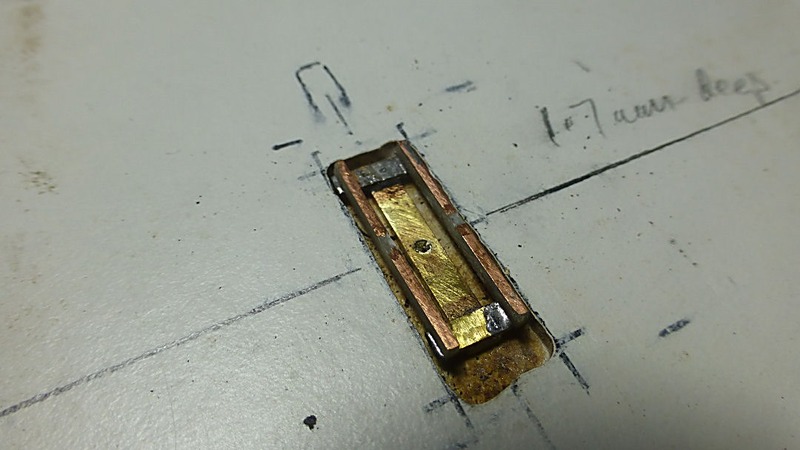 This was taped down to a piece of glass and PCB strip glued down. 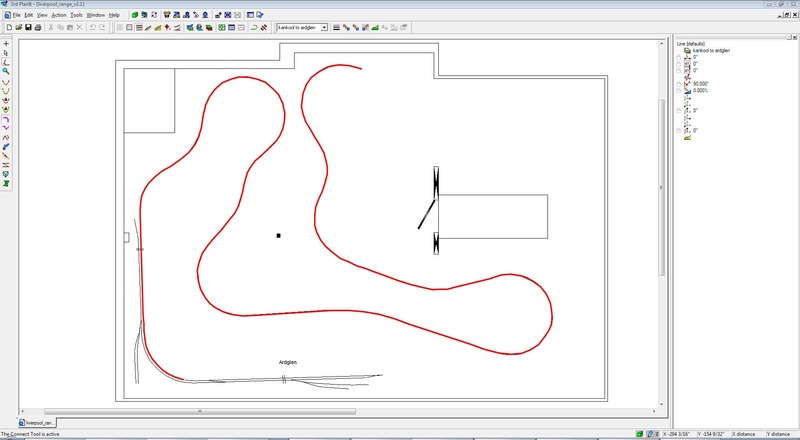 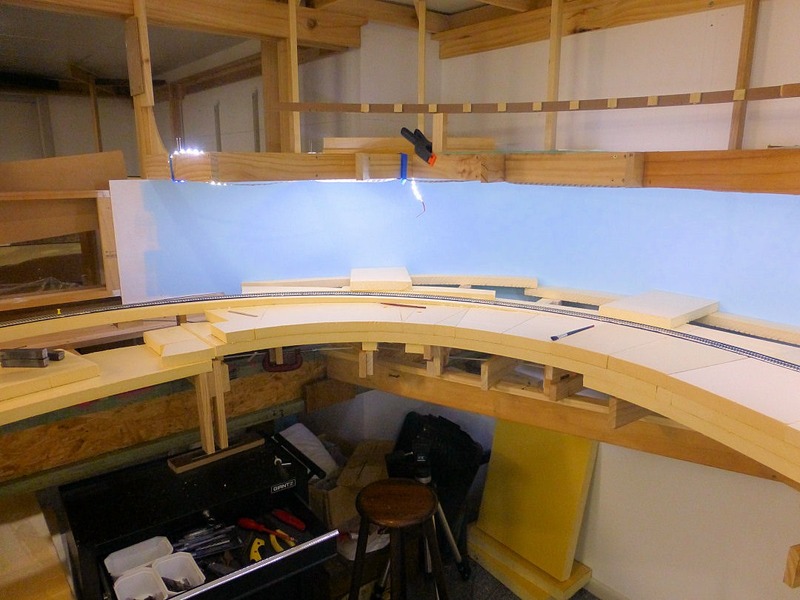 During the first build, I came up with a specific order of construction, hence the numbered circles in the image below. 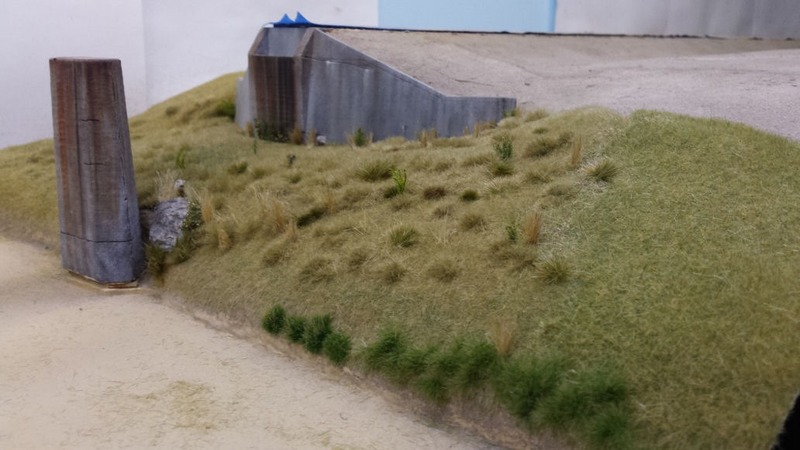 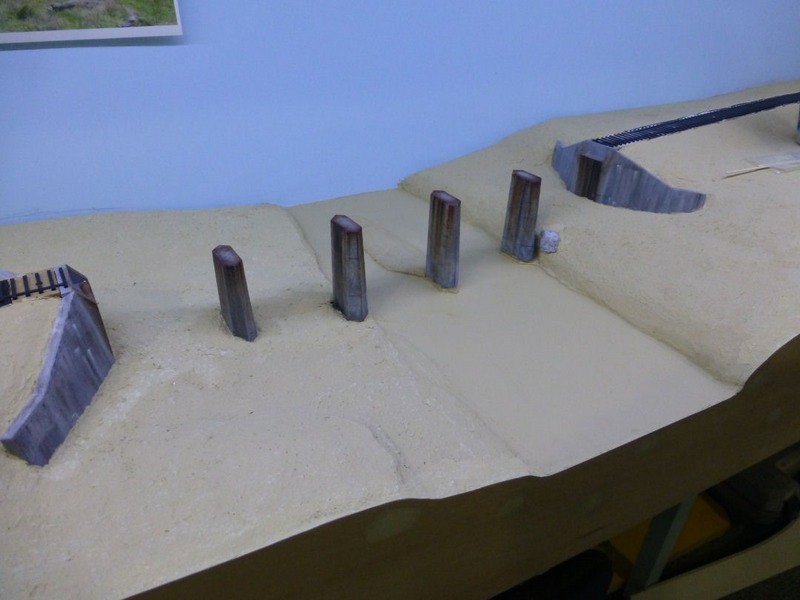 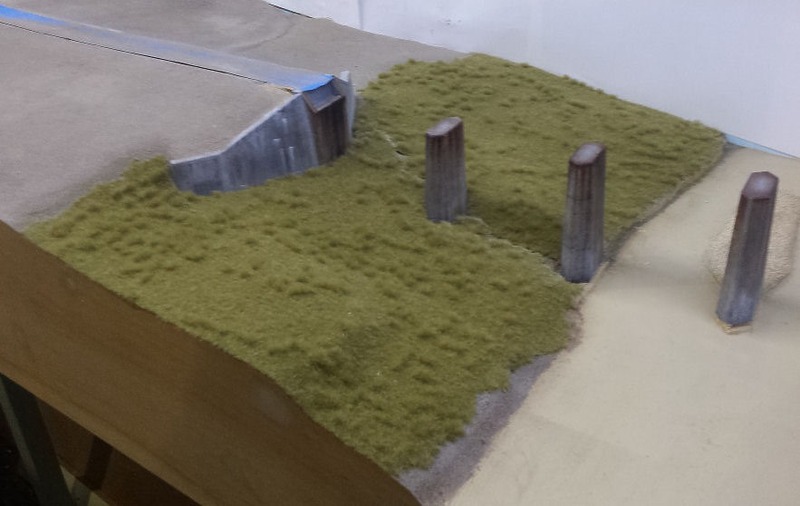 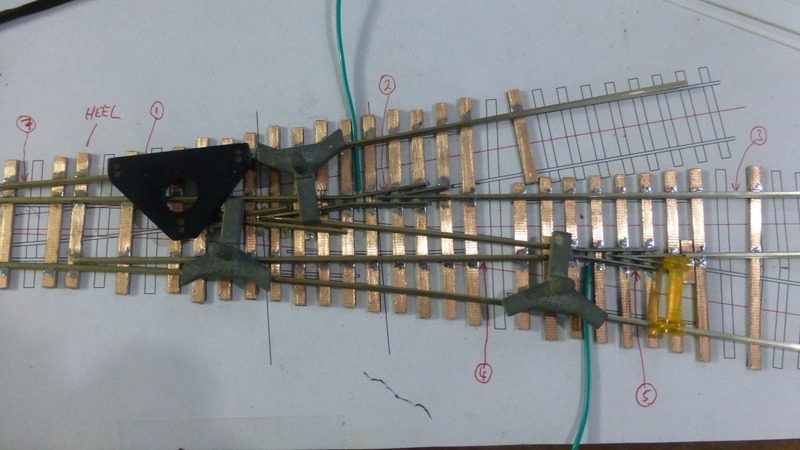 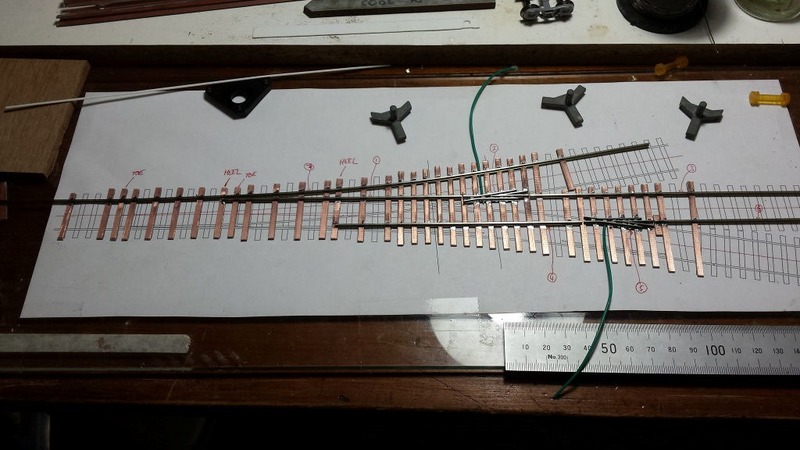 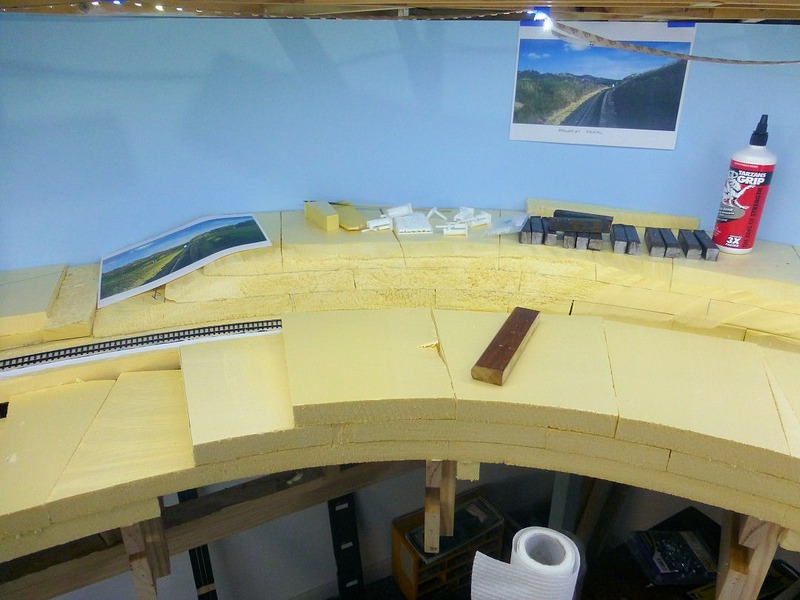 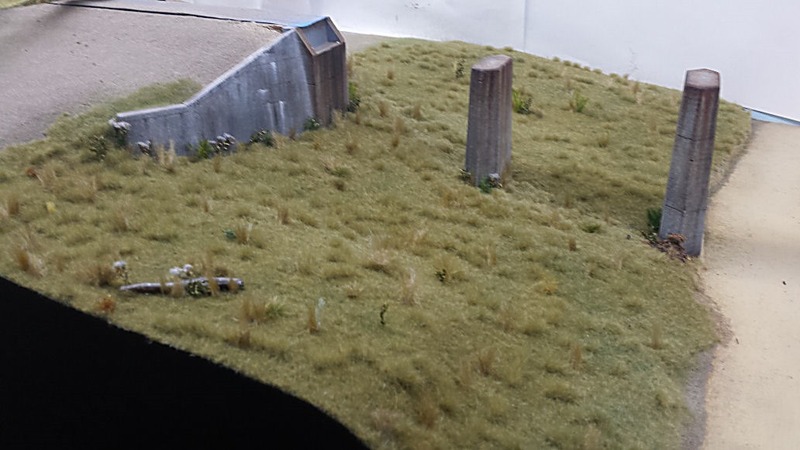 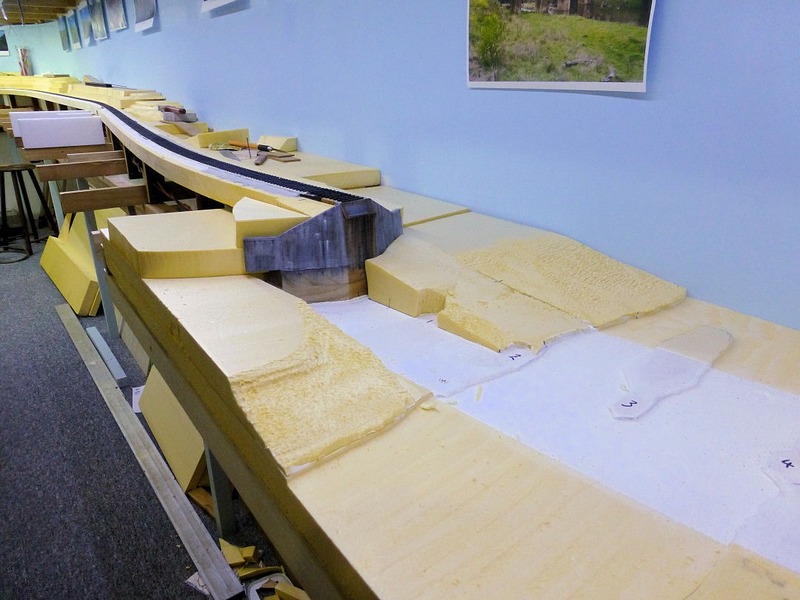 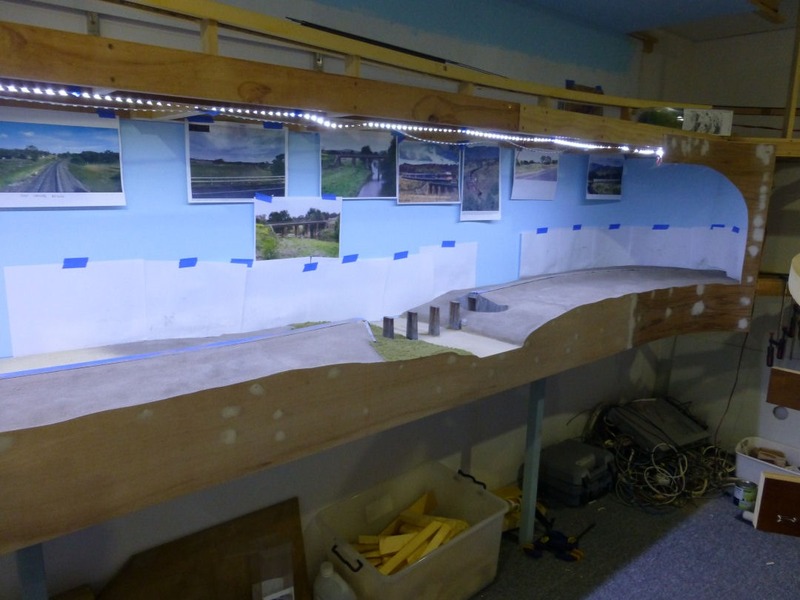 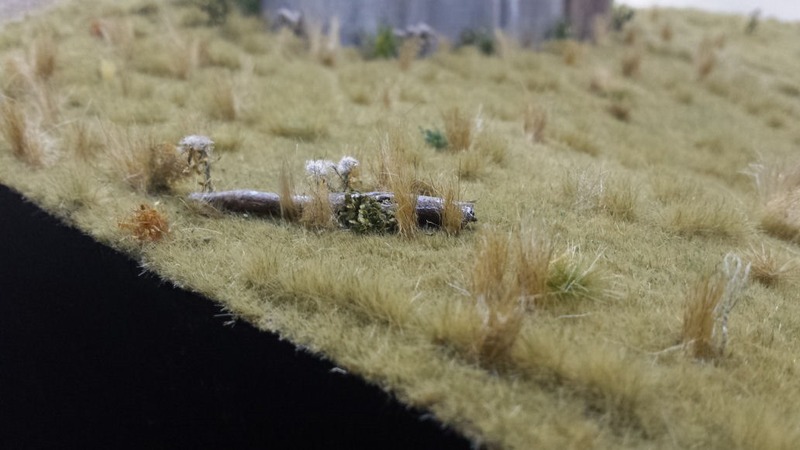 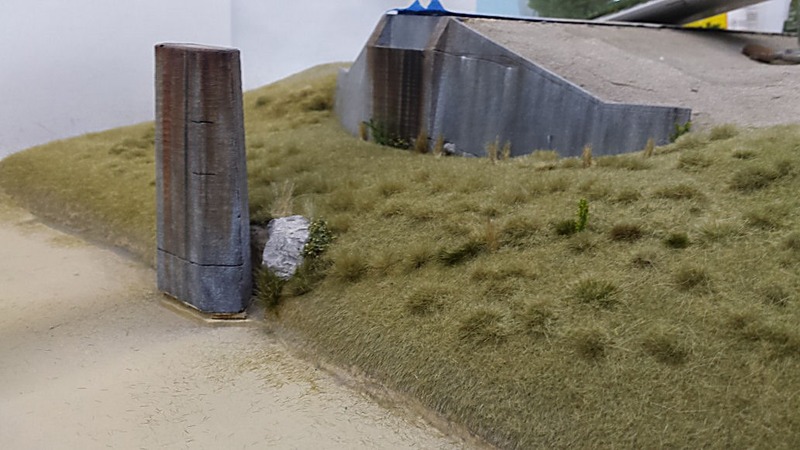 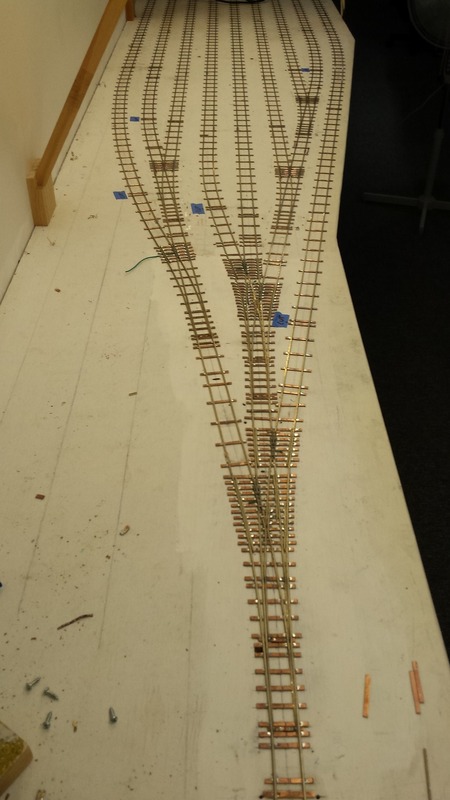 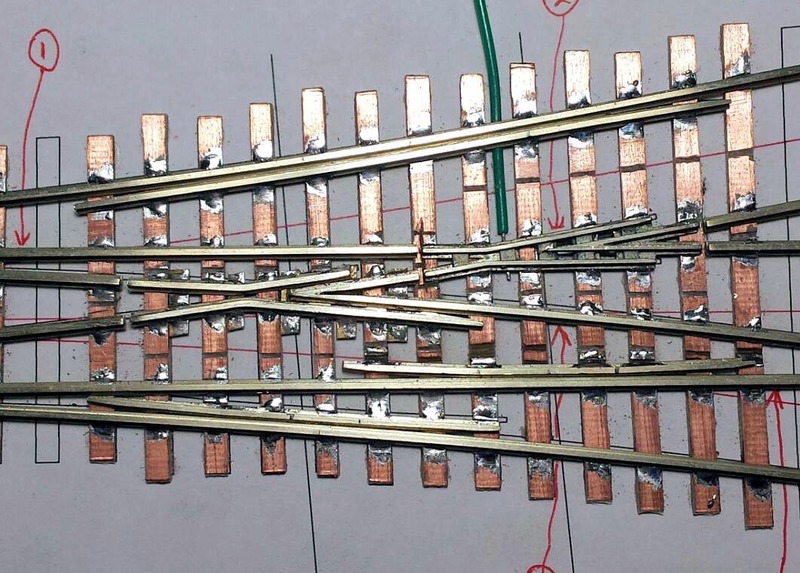 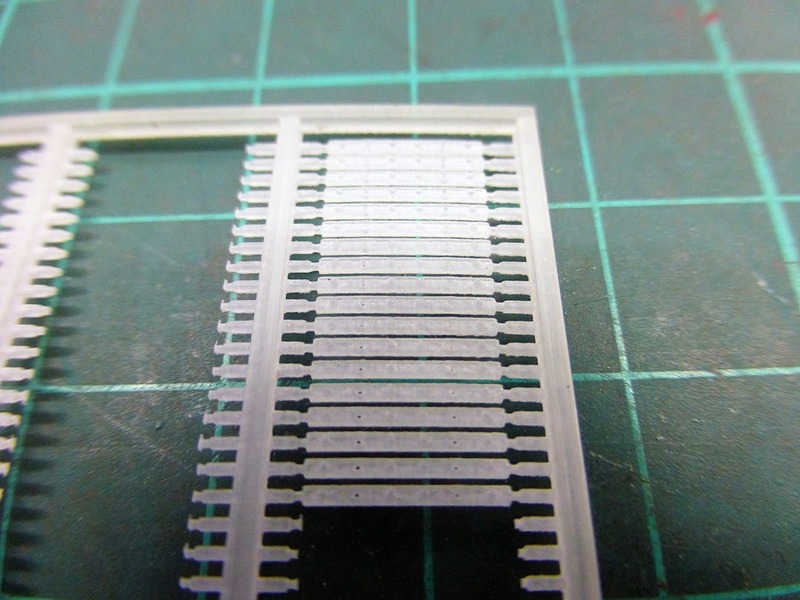 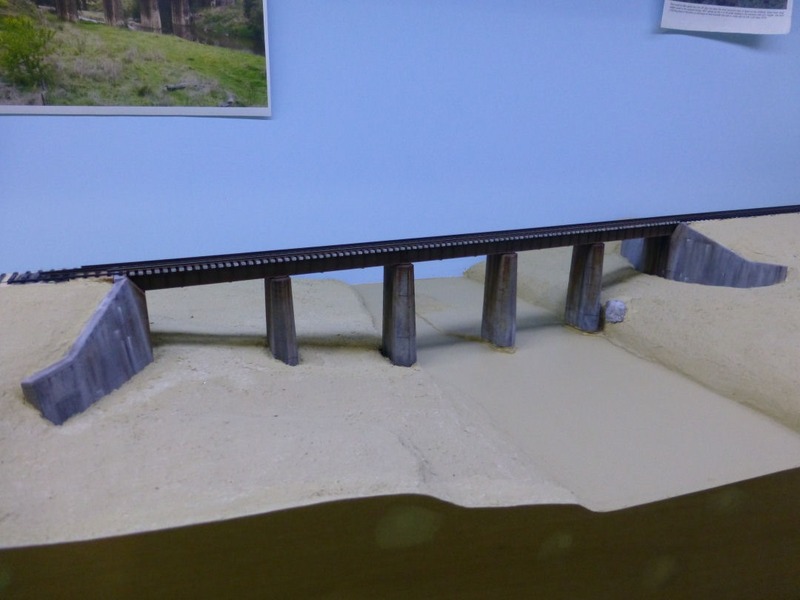 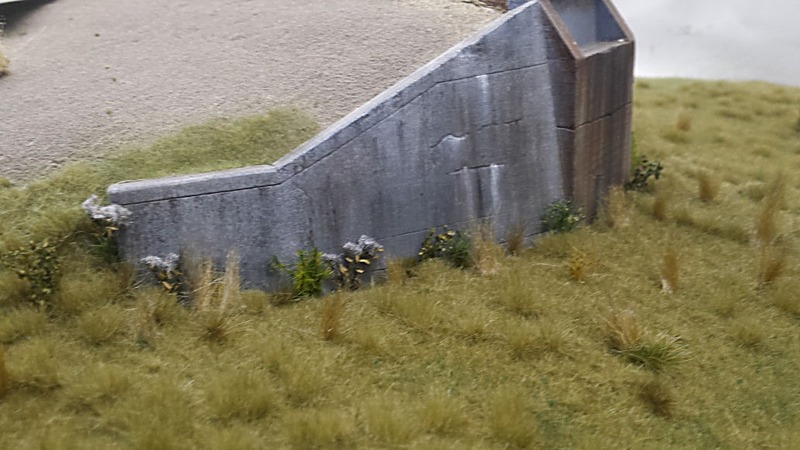 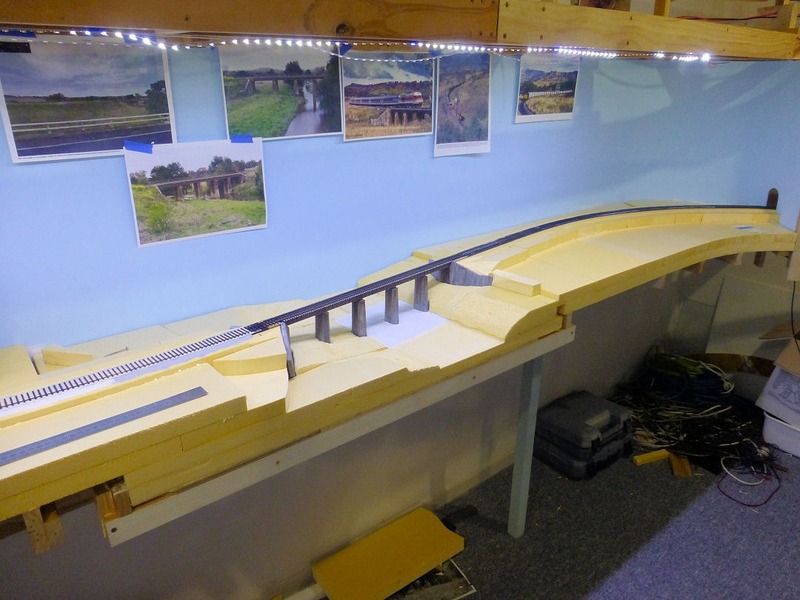 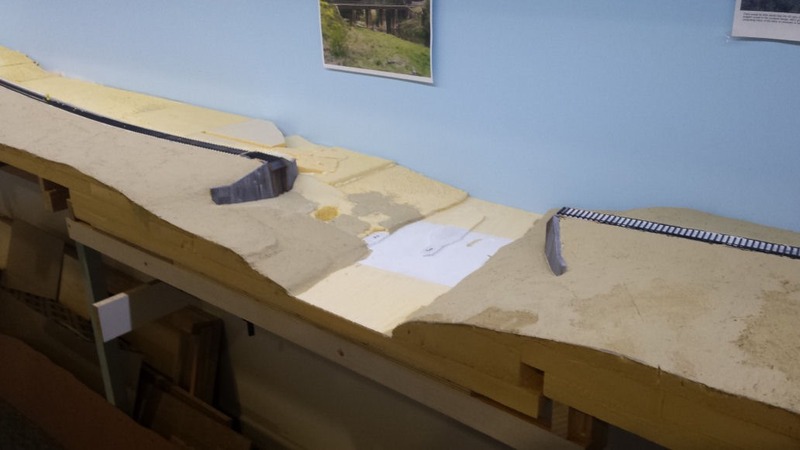 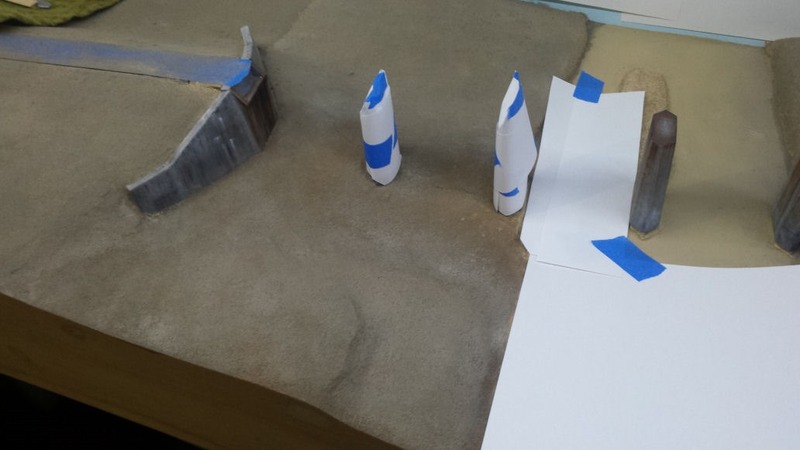 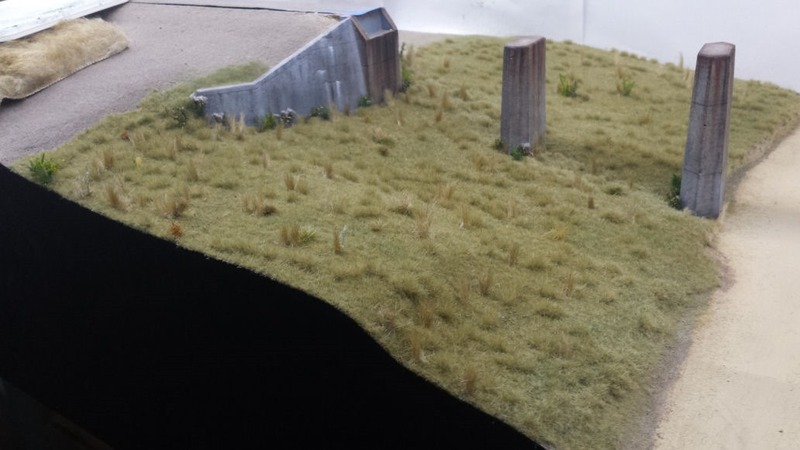 The image shows some of the main components in place including the two etched 1:6 vee crossings. 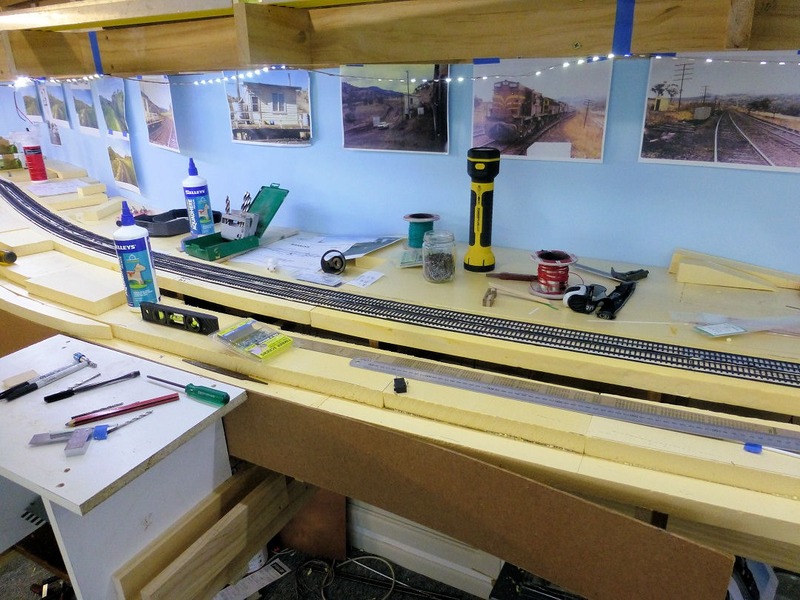 At around this stage of construction, I started building the third vee crossing. 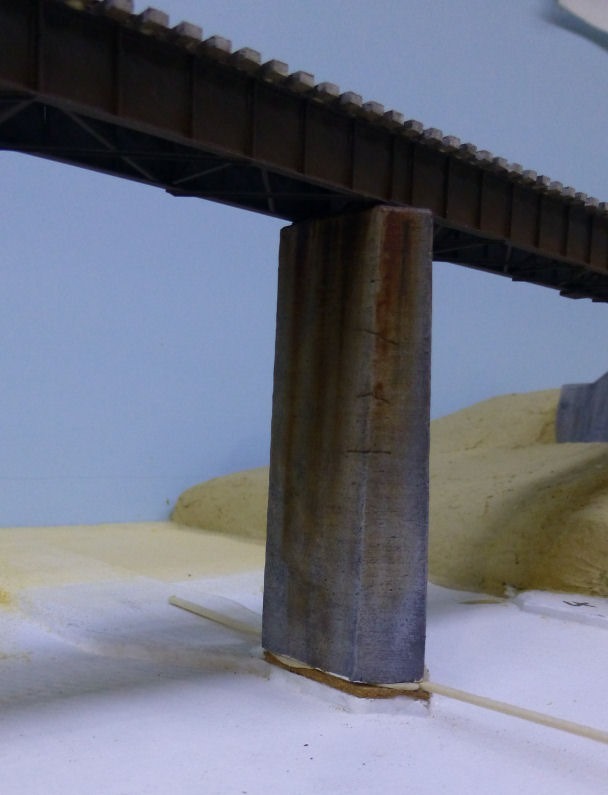 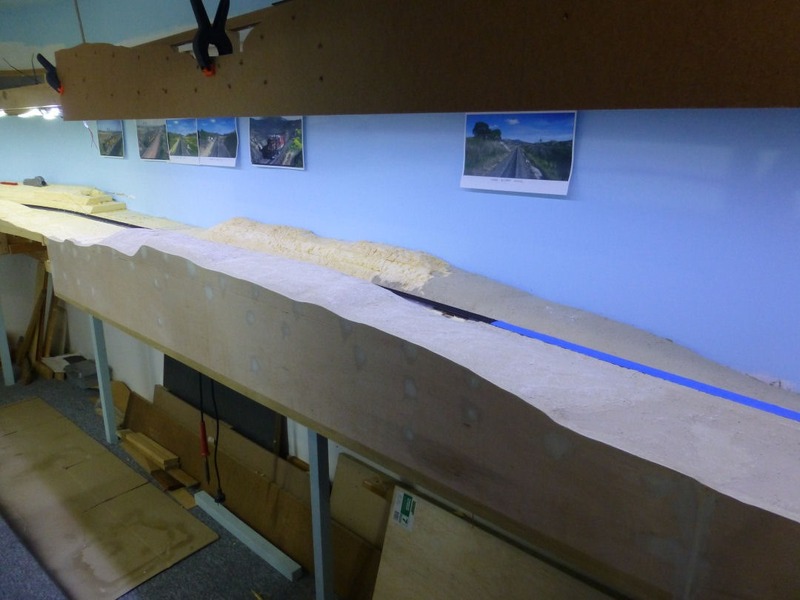 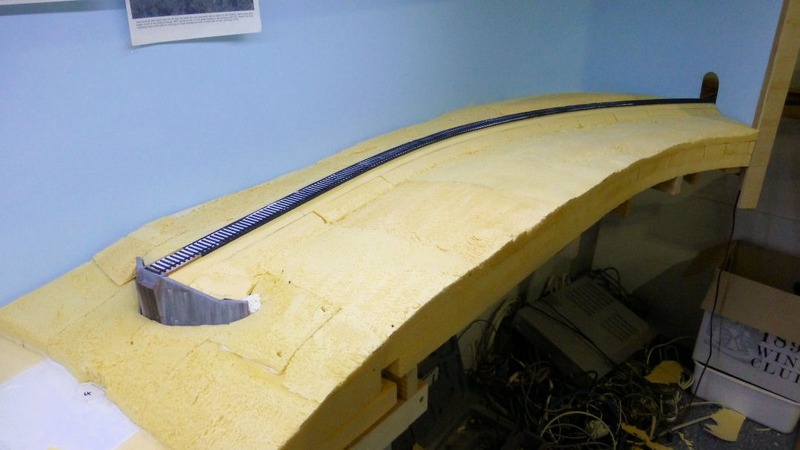 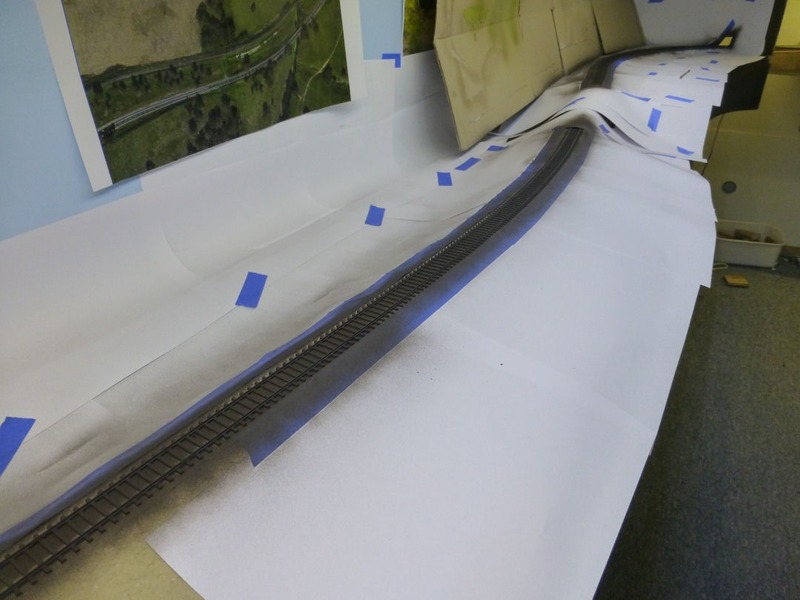 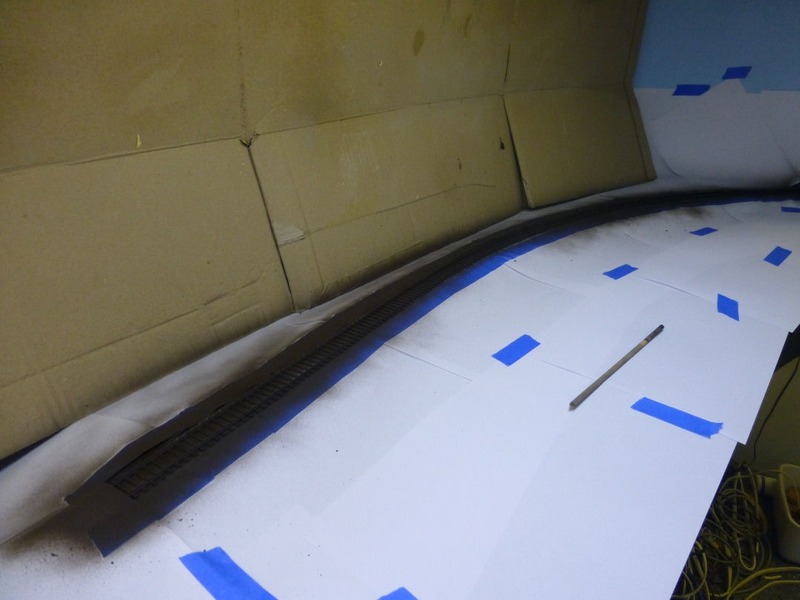 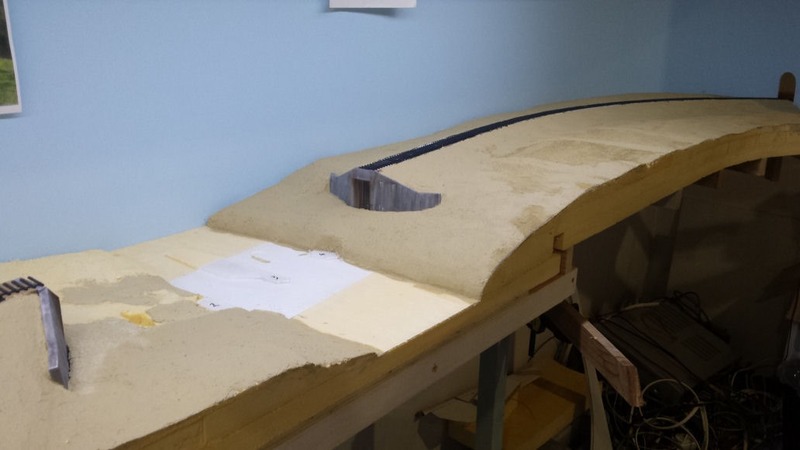 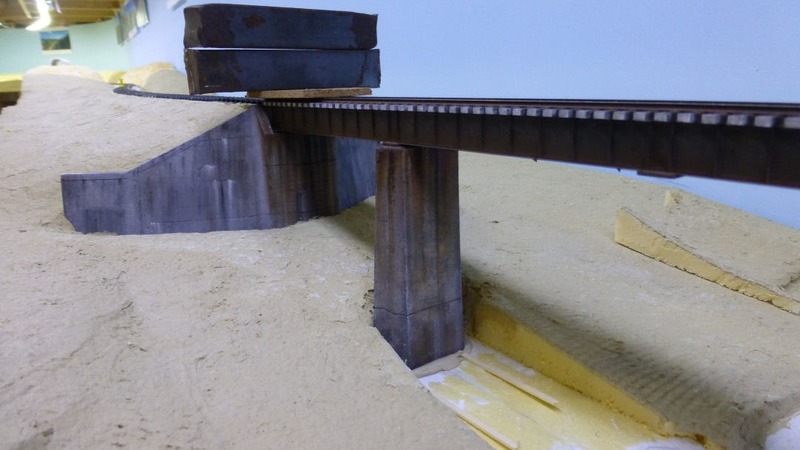 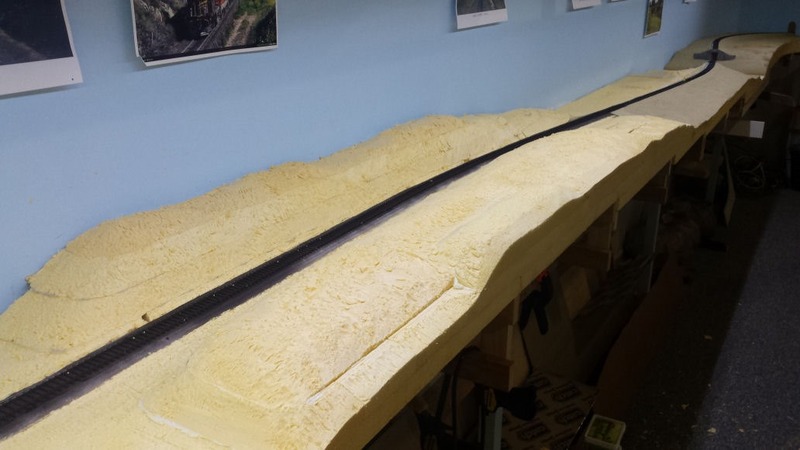 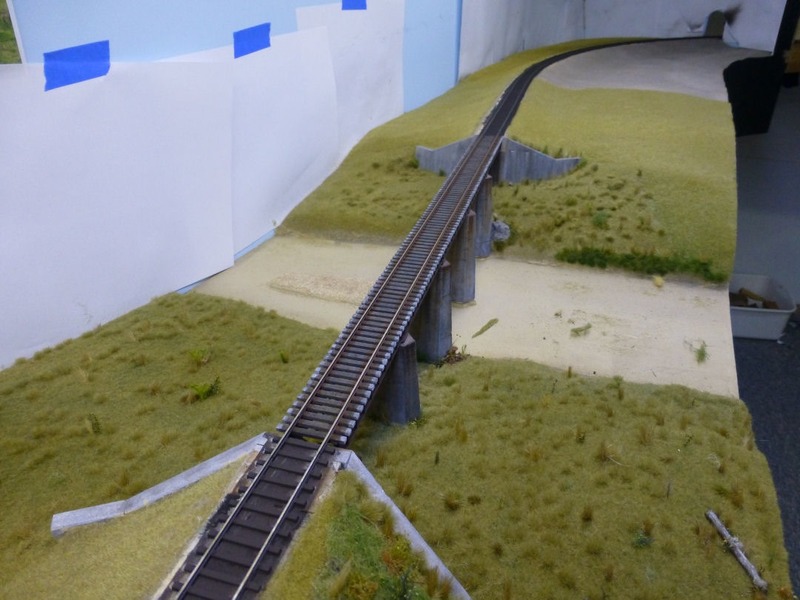 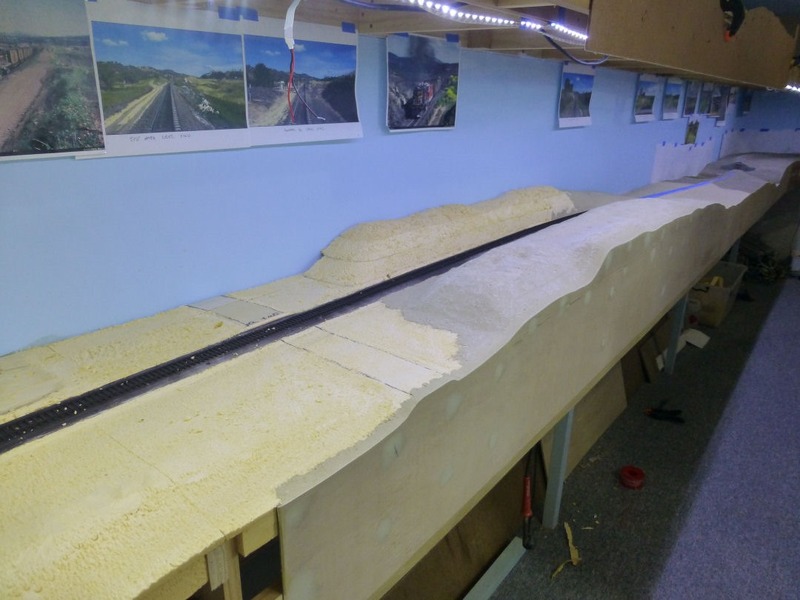 This crossing is also slightly curved so I printed out a section of the drawing at twice HO scale to assist in laying out the rail to the curves. 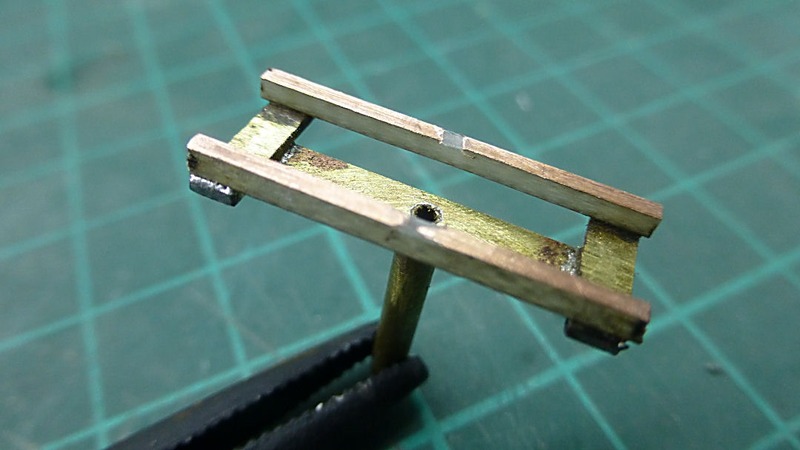 I had to come up with a method of fabricating the vee crossing as a sub-assembly that could be fitted into the turnout. 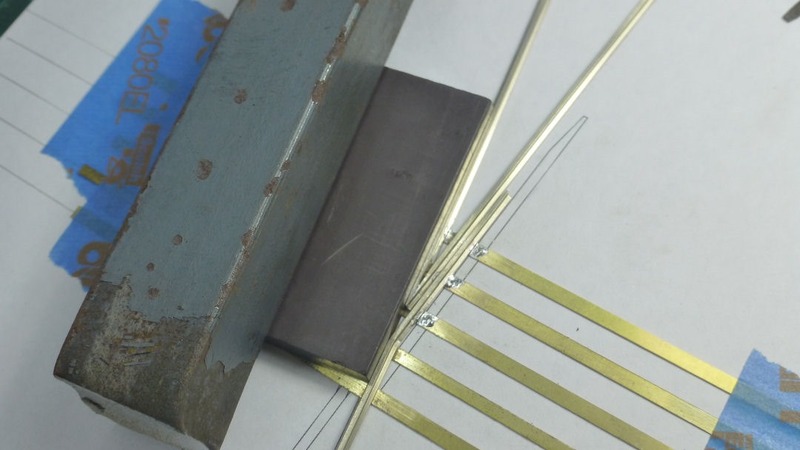 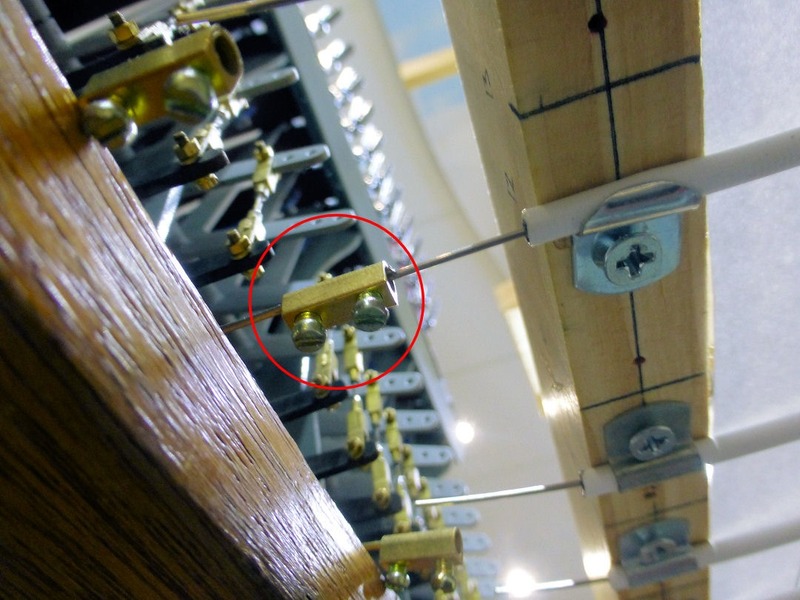 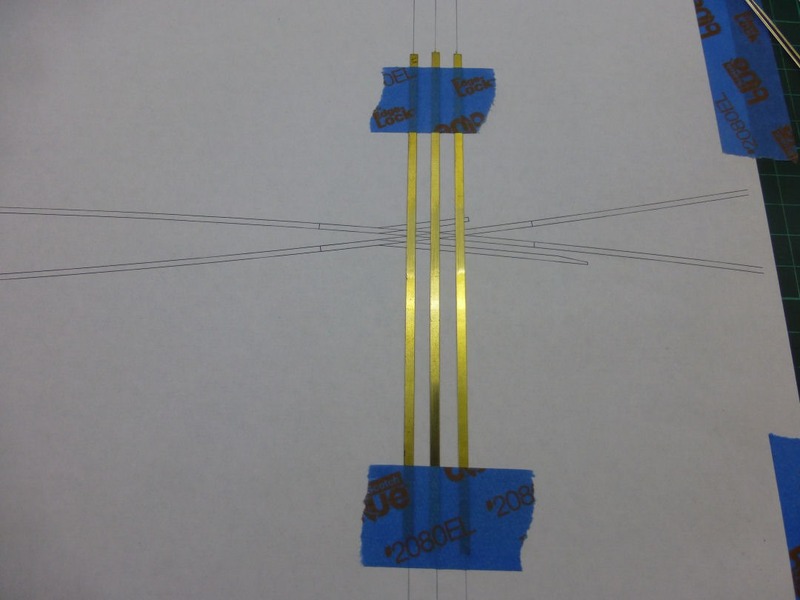 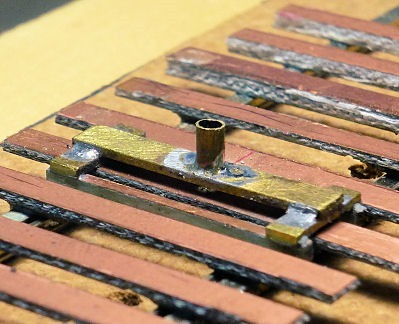 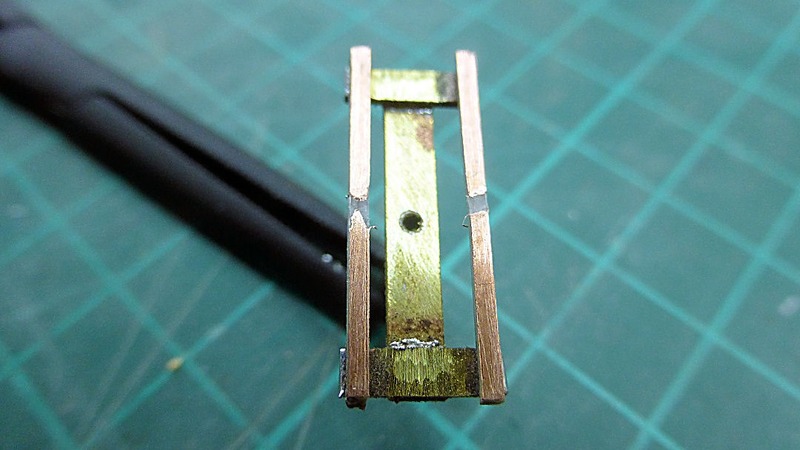 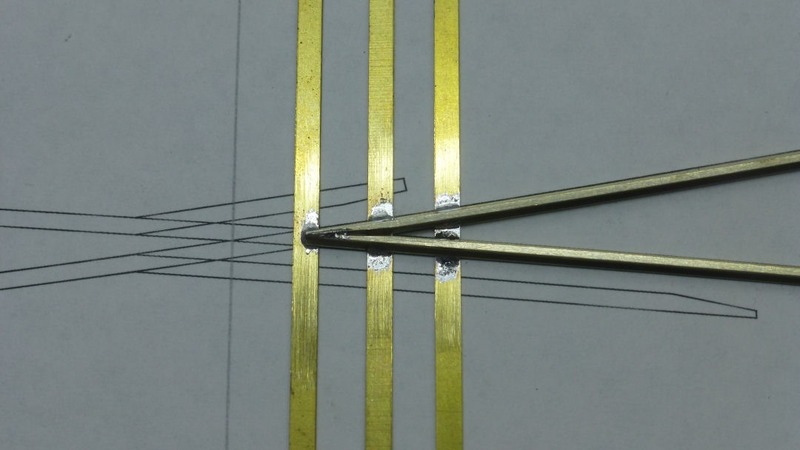 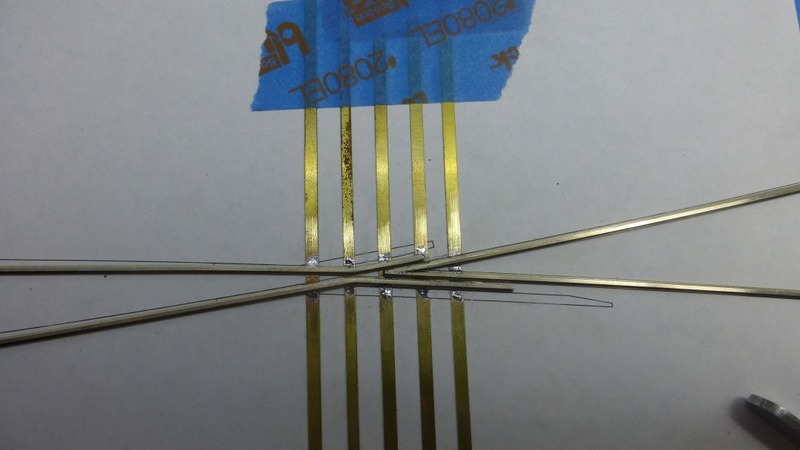 Using brass strip spaced to fit in between the PCB strips, these were taped down over the drawing. 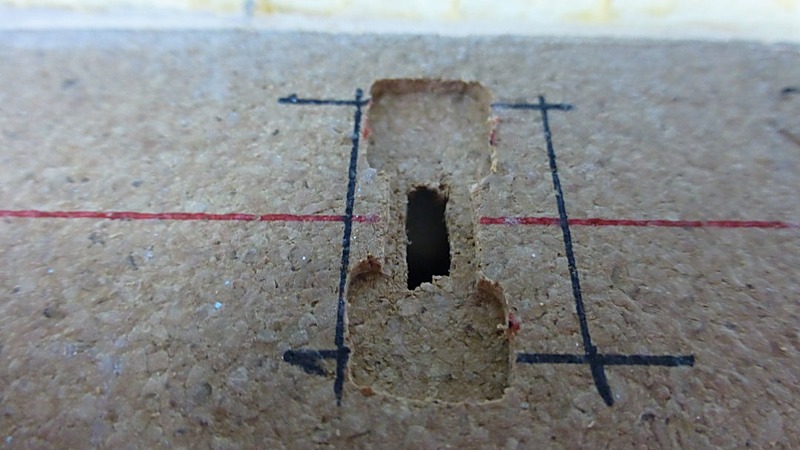 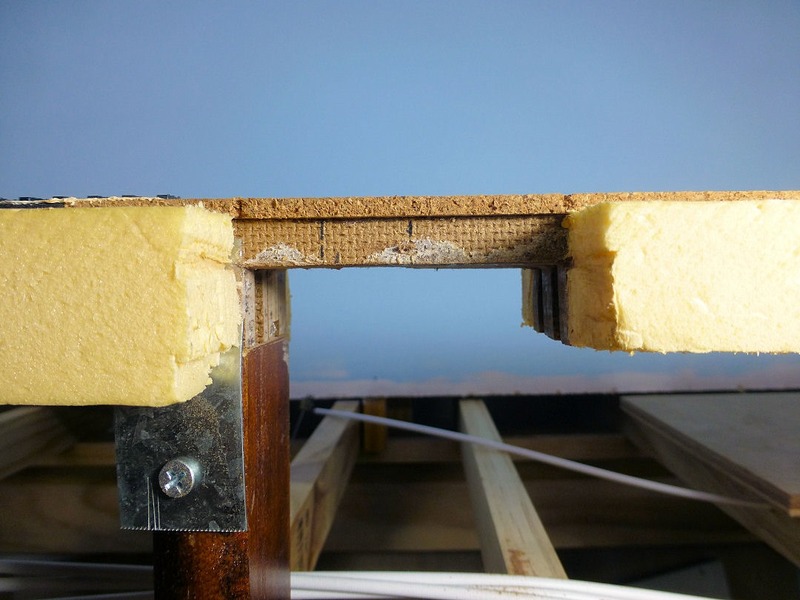 The first task was to file up the two halves of the vee and fix in place. 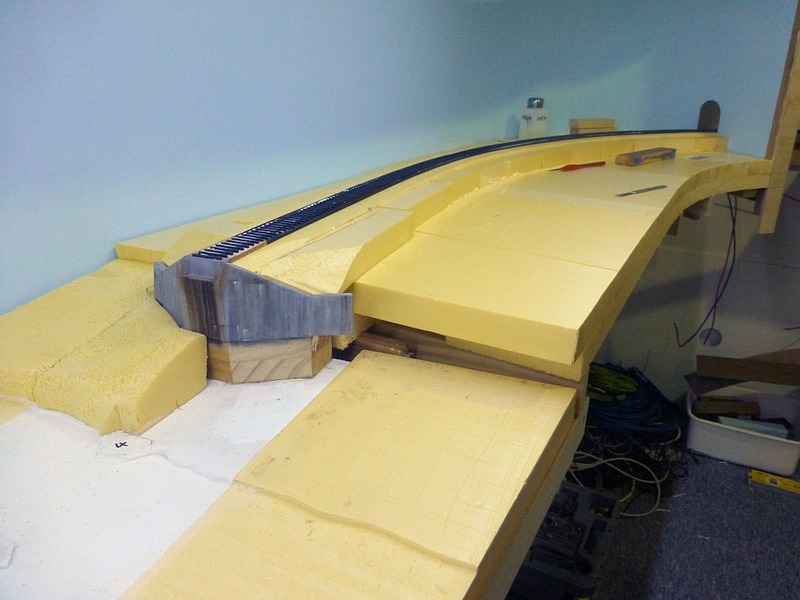 Then the wing rails were bent and shaped and checked against the template. 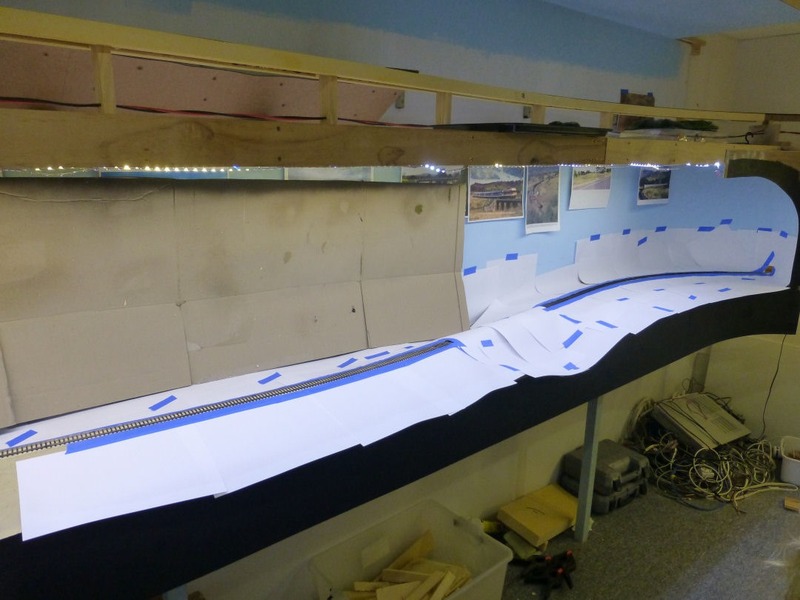 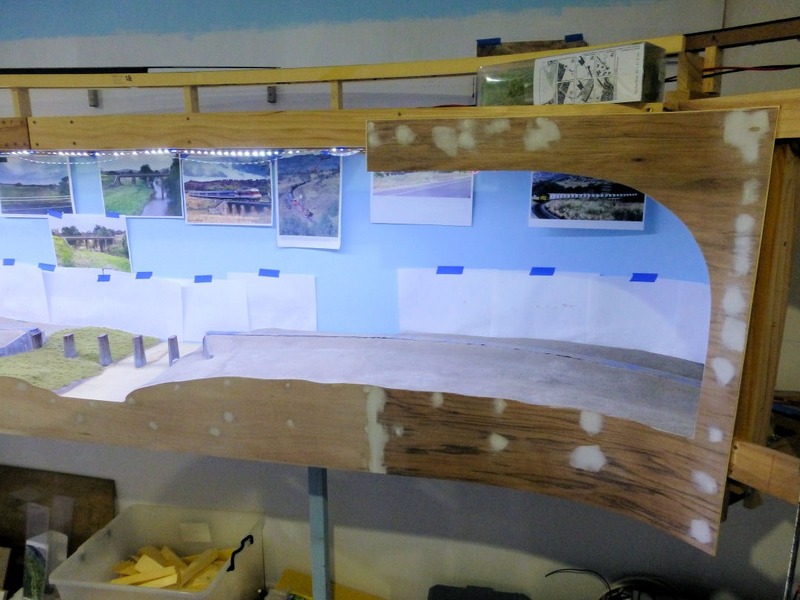 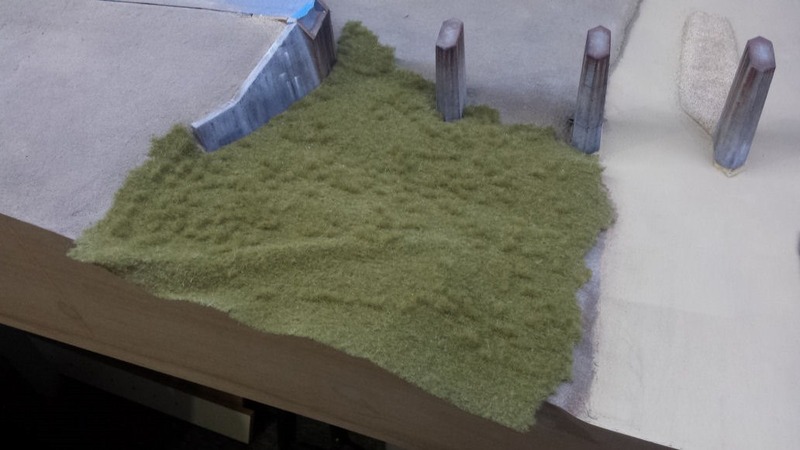 Long pieces of rail were used to make it easier to lay against the template. 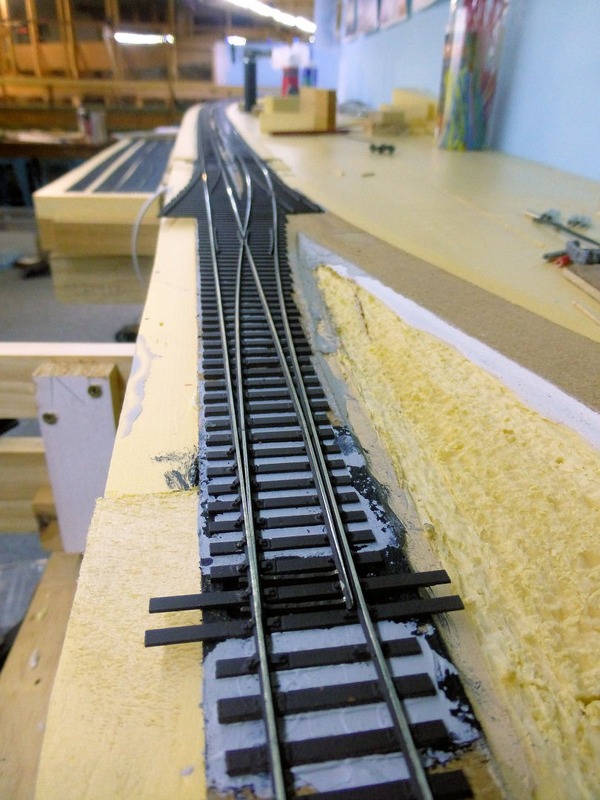 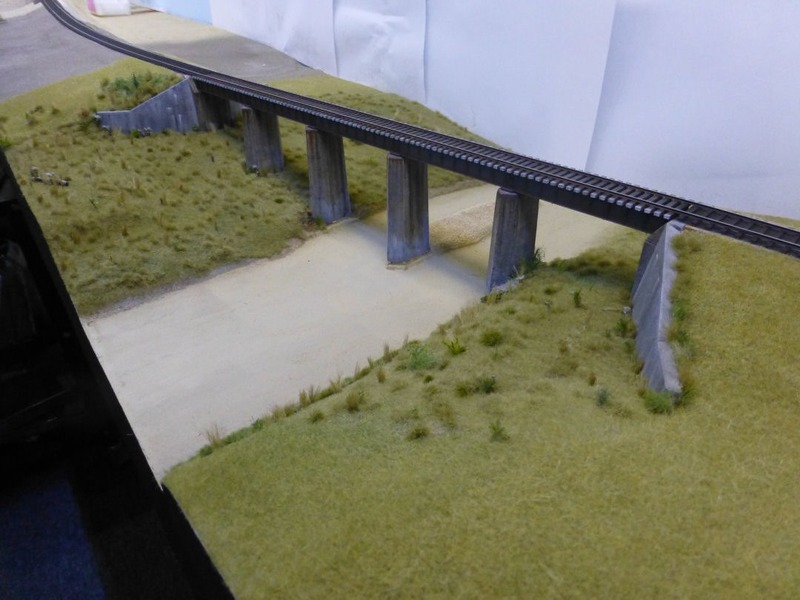 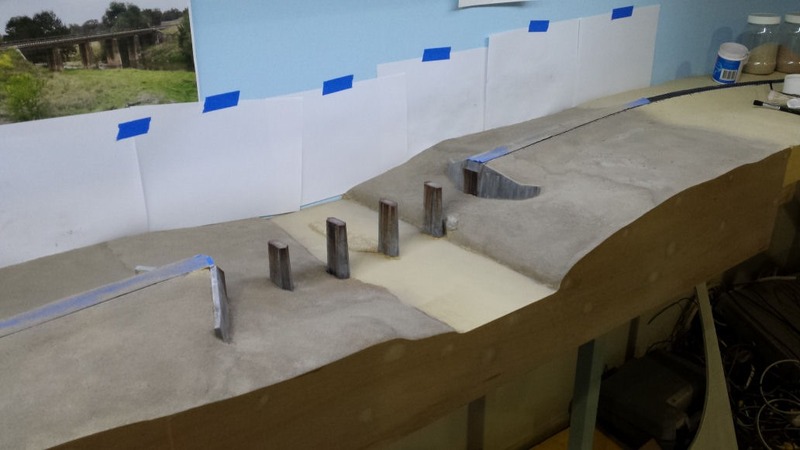 The completed crossing was then trimmed to size and fitted into the turnout using multiple gauges. 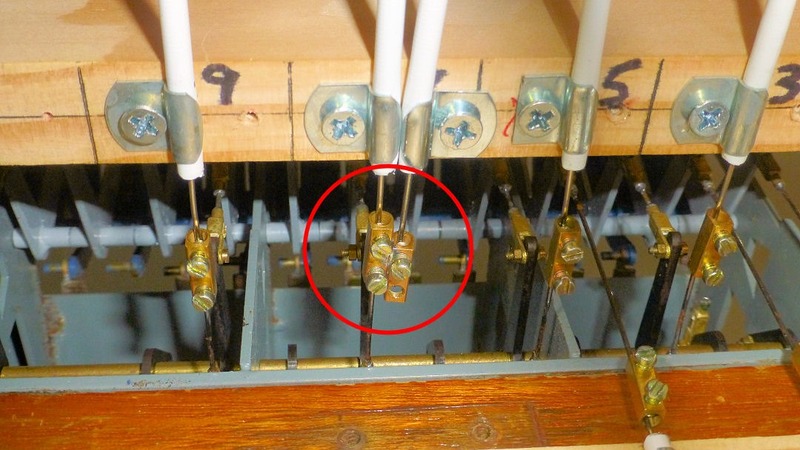 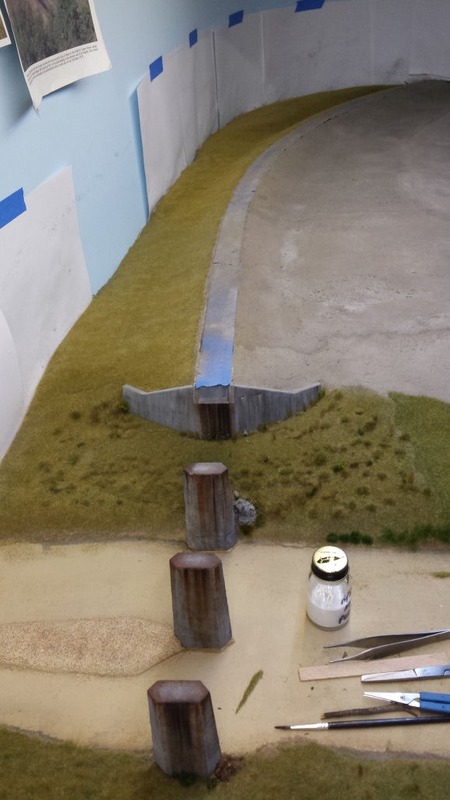 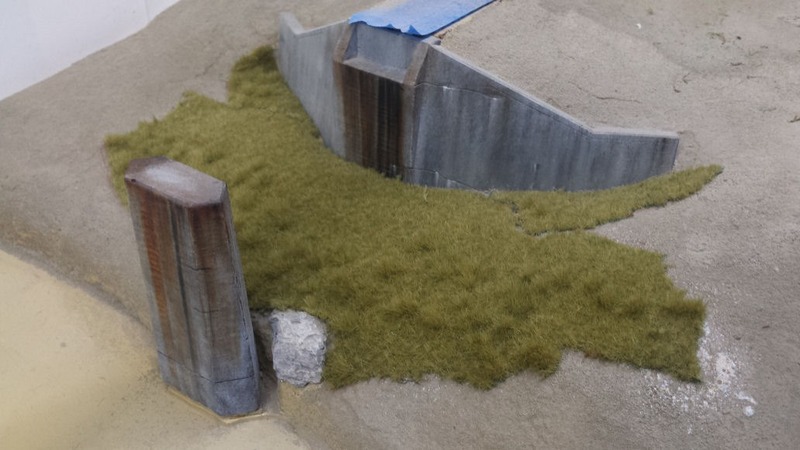 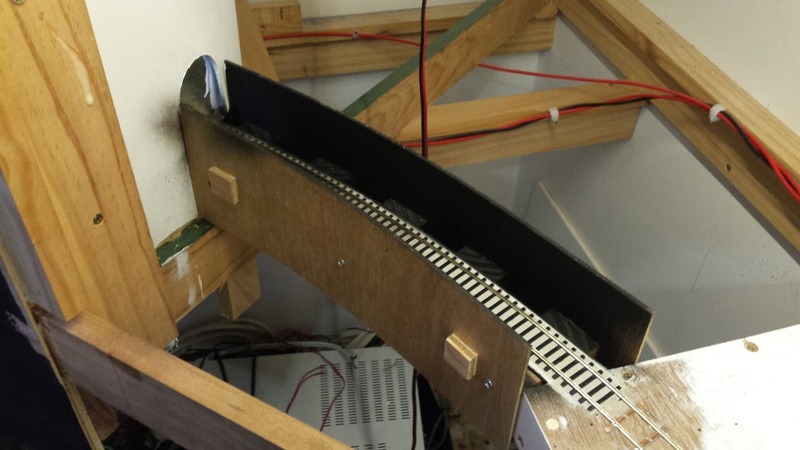 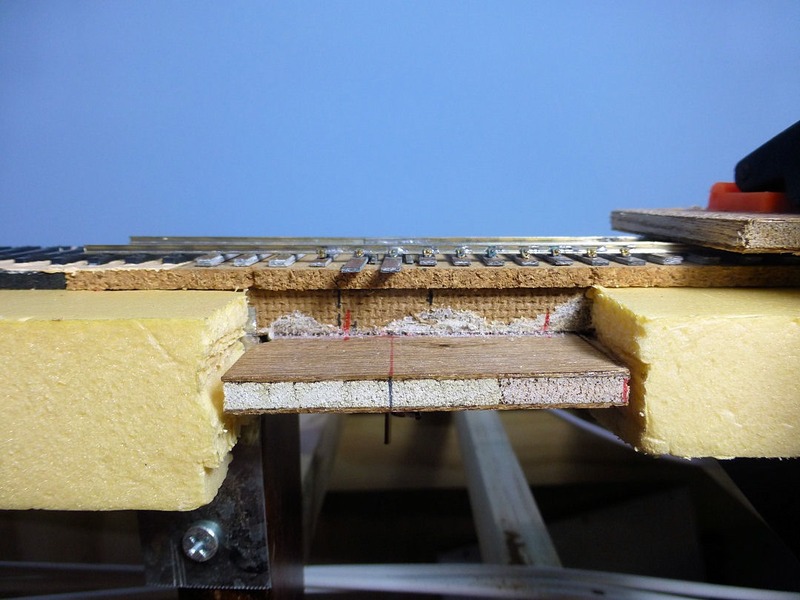 The picture below show the completed 3-way turnout, less point blades. 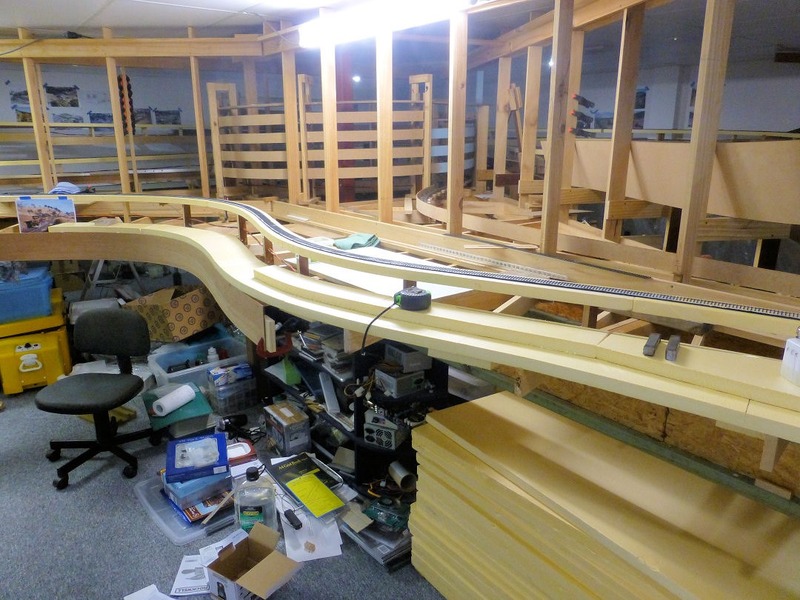 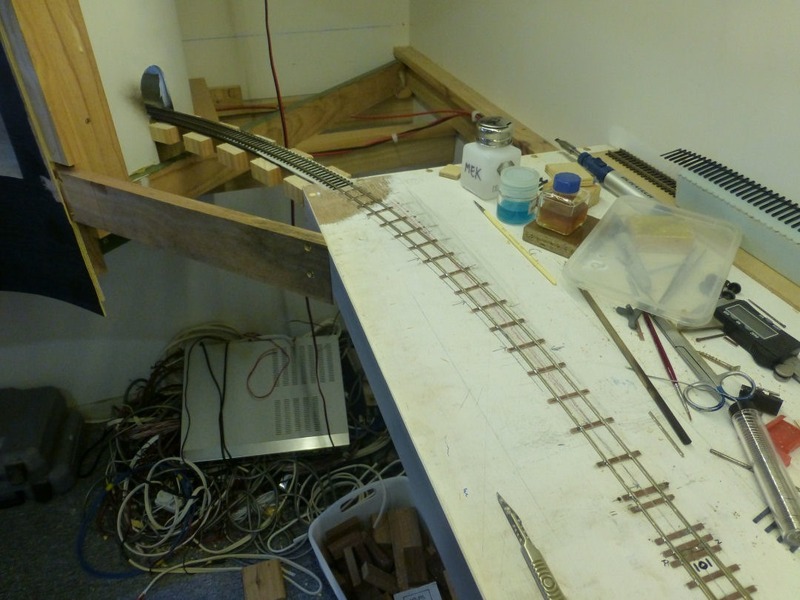 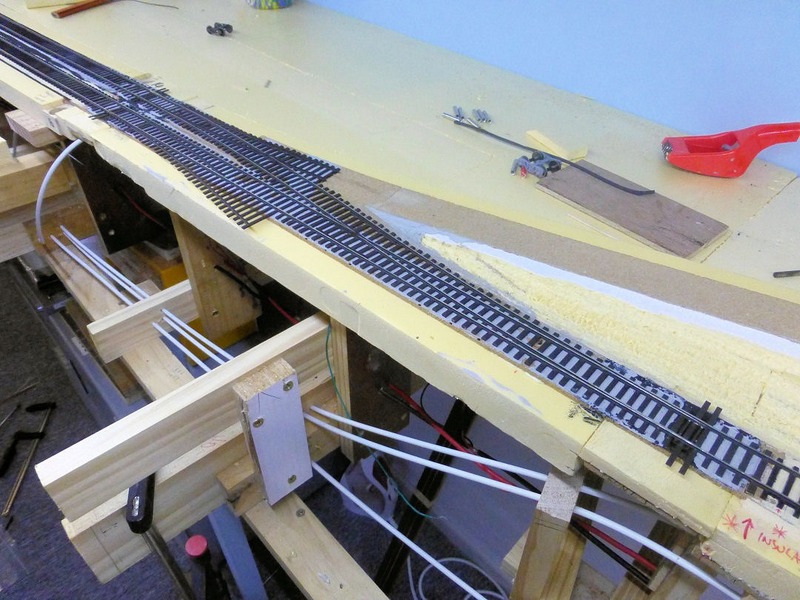 There is a bit of tidy up work to do yet as well as re-mounting and re-wiring the point motors, but at least the trackwork is done. 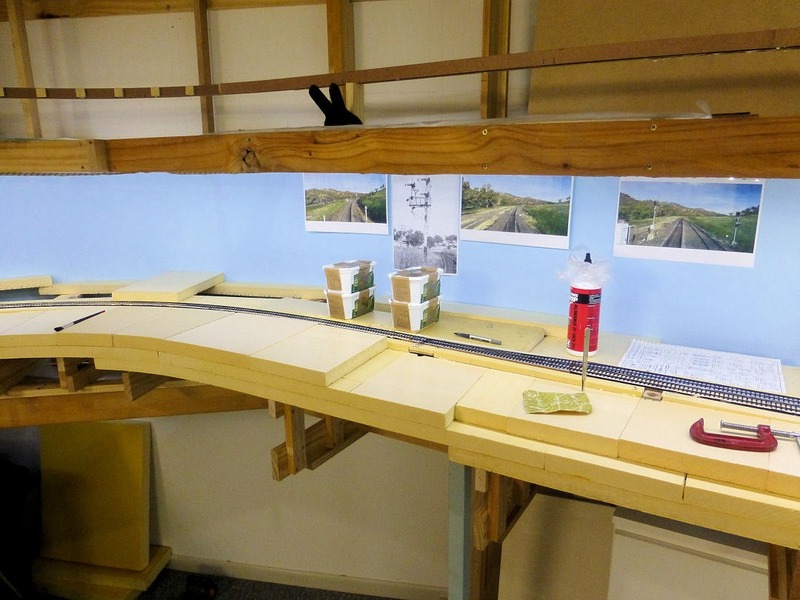 Now to do the same at the other end!